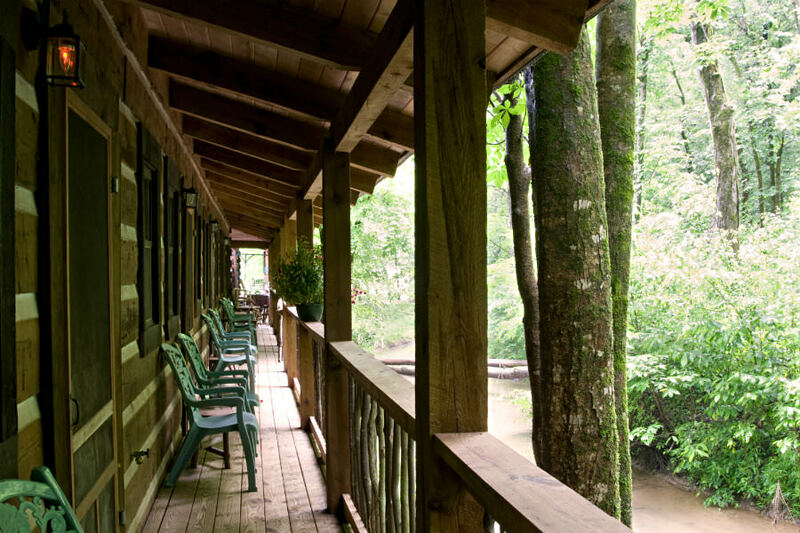 The Main Lodge is the heart of the property and where breakfast is served each morning. 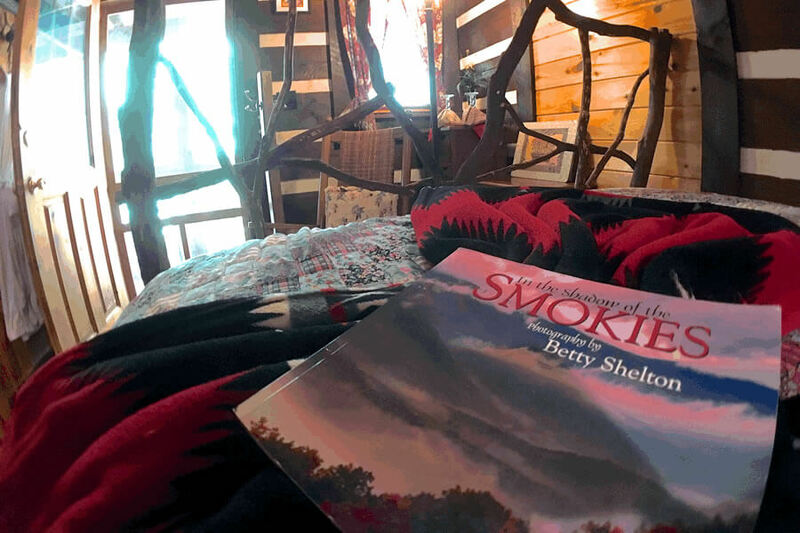 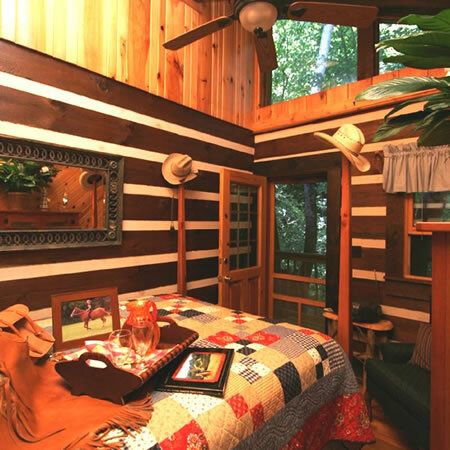 Named after the valley in the National Park, this cozy tree-bed room opens up to the creek and the forest beyond. 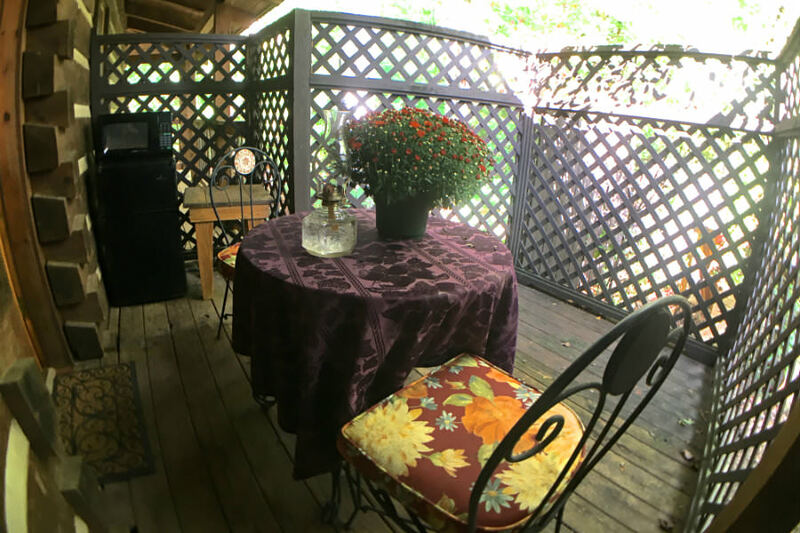 The narrow balcony offers a seating area which is perfect for your early (or late) morning coffee to enjoy the mountain air. 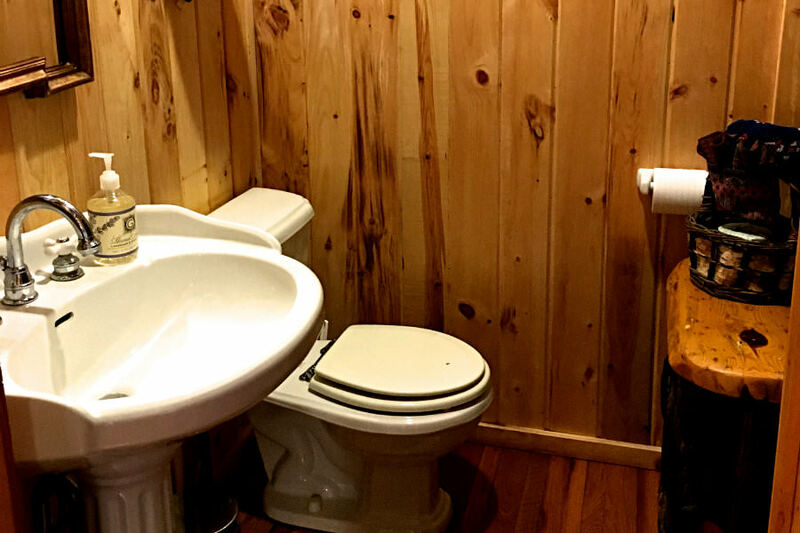 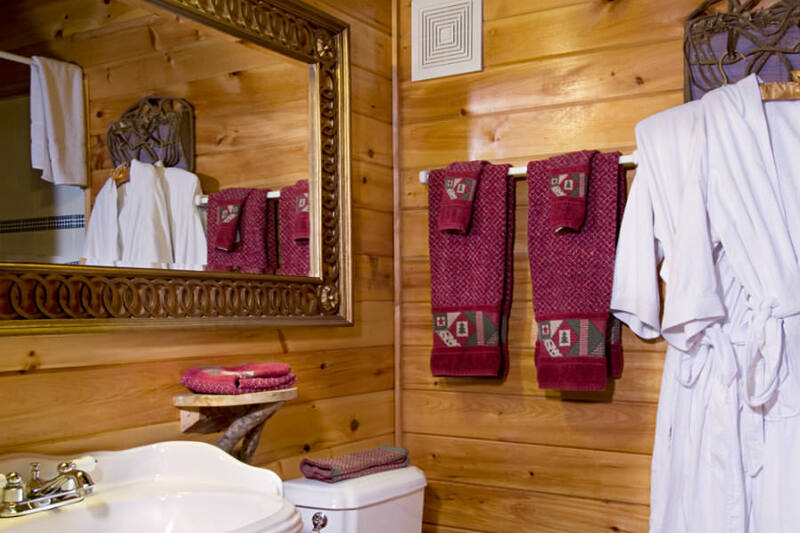 The private bathroom has a combined shower and jetted tub feature for tub therapy. 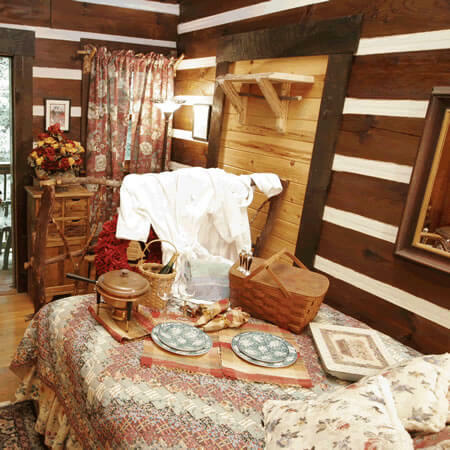 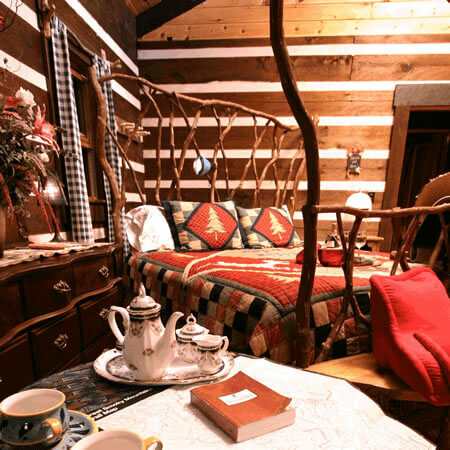 Named after the waterfall up a 4-mile trail at Greenbrier Pinnacle, this pleasant tree-bed room is on the creek. 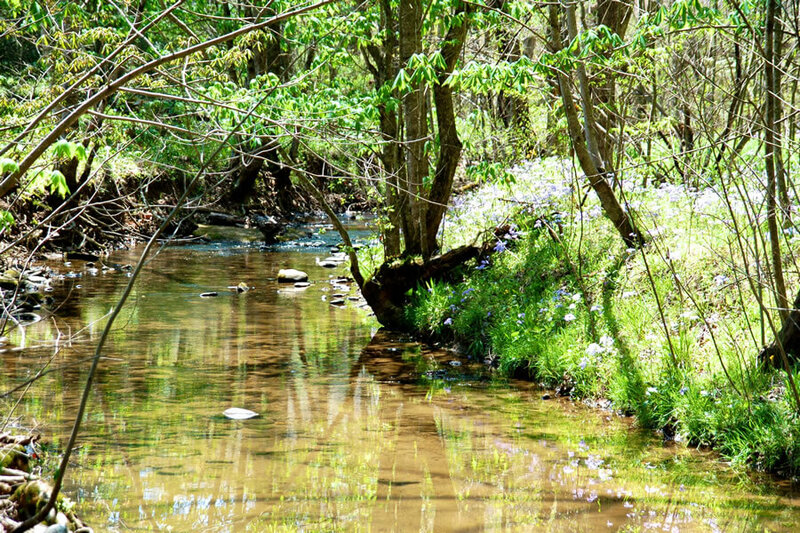 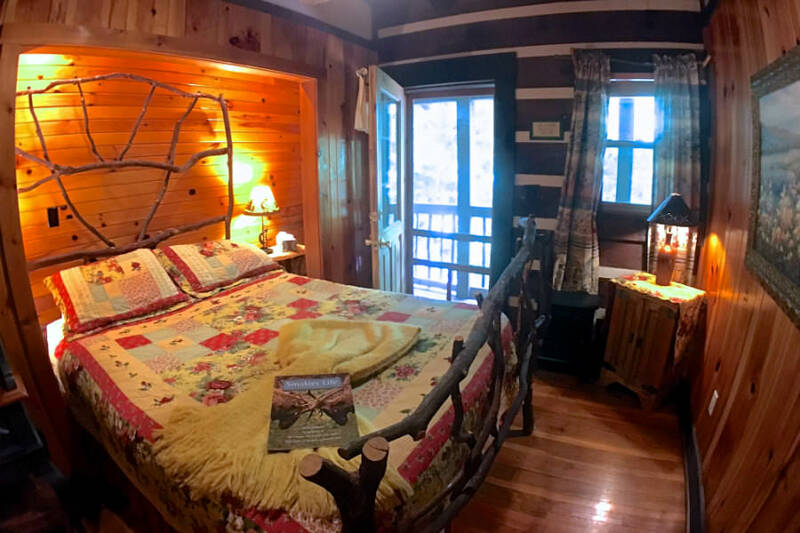 Windows and balcony door may be left open for evening fresh air, just the screen door between you and the gurgling creek and rustling leaves of the forest. 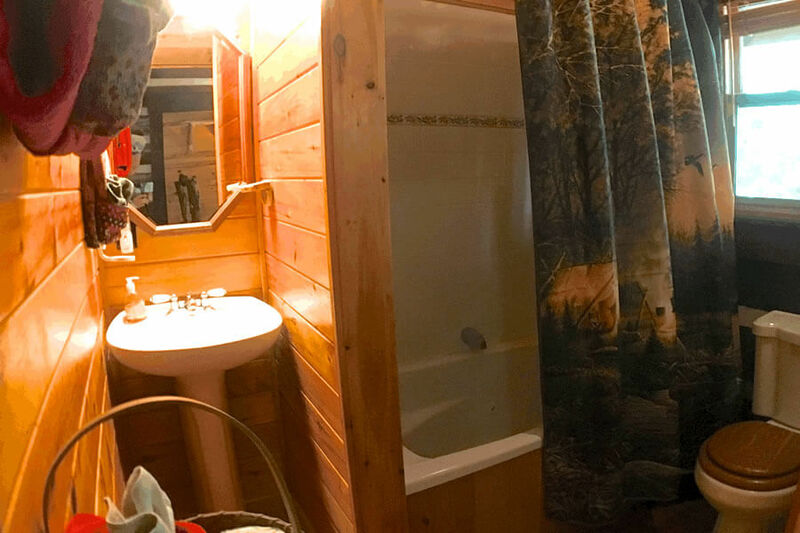 The bath features a tub/shower Jacuzzi combination in white tile. 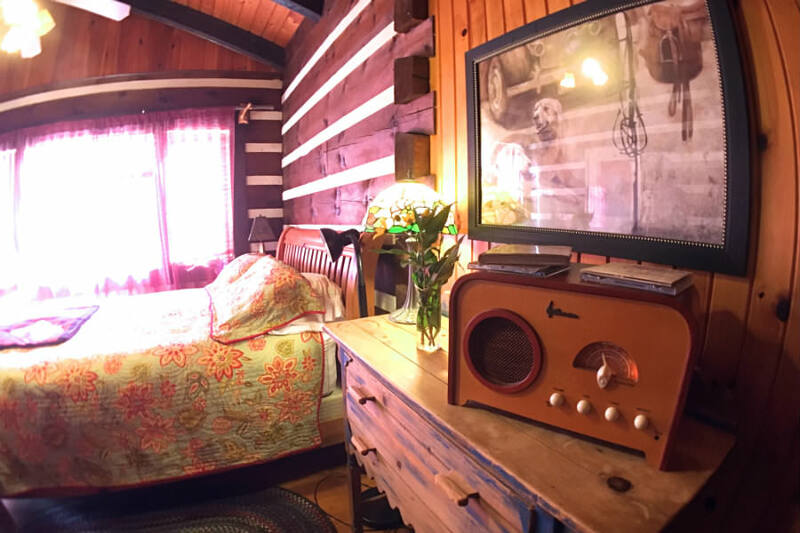 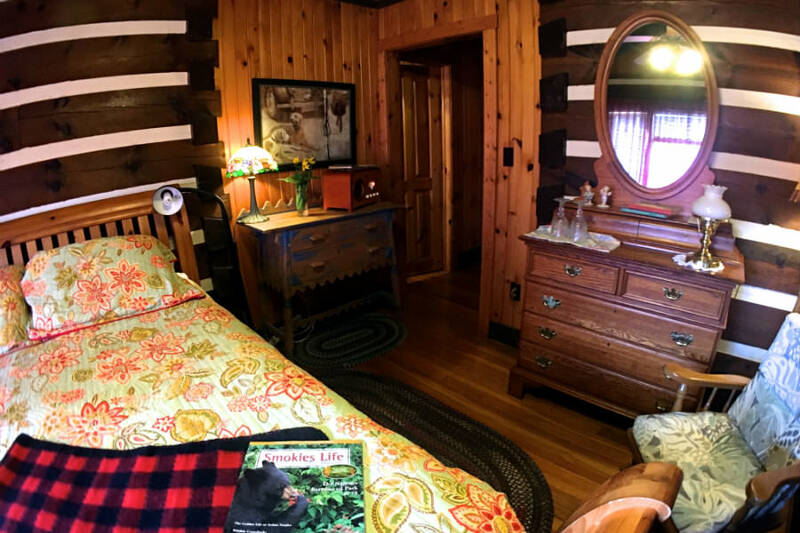 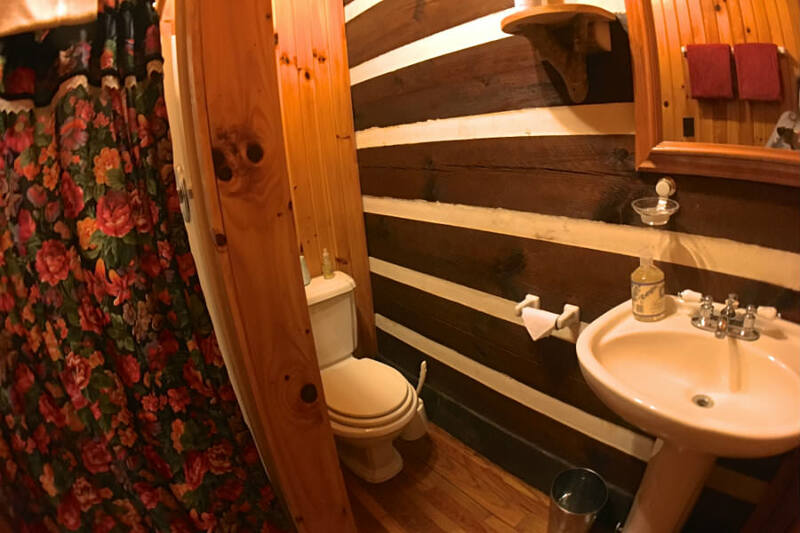 A small desk and rocking chair, stereo, and paddle fan in the knotty pine and log setting with red and yellow themes make this a colorful pleasant stay. 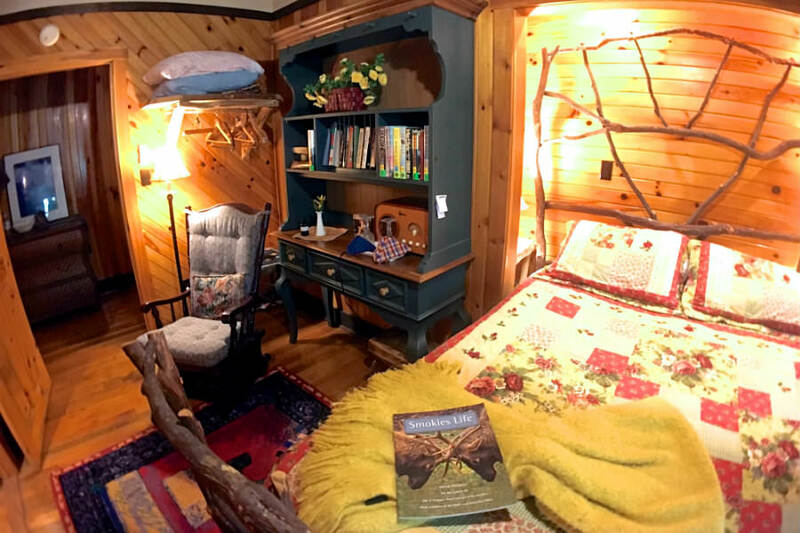 The twisted rhododendron branches of this massive tree bed shape the flow of this room overhanging the creek out its door. 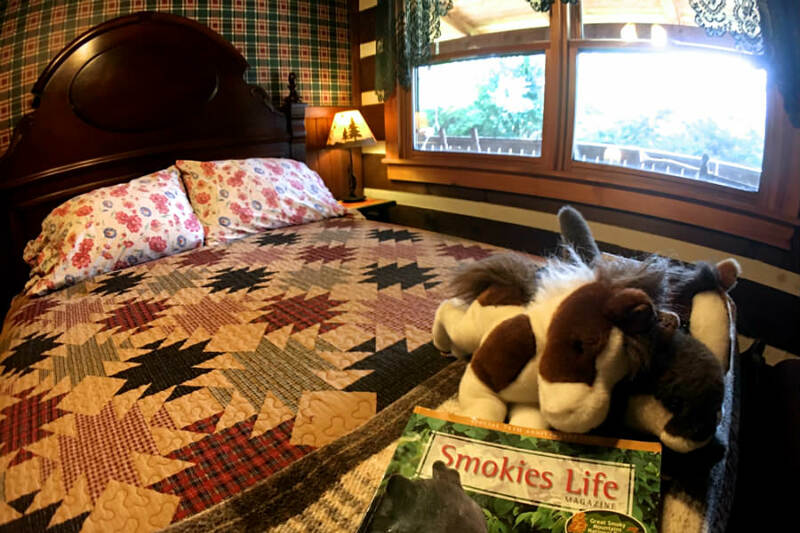 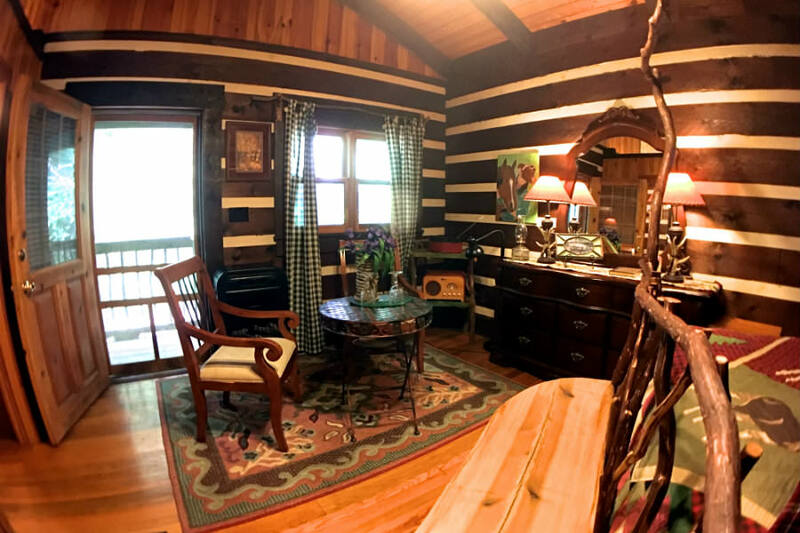 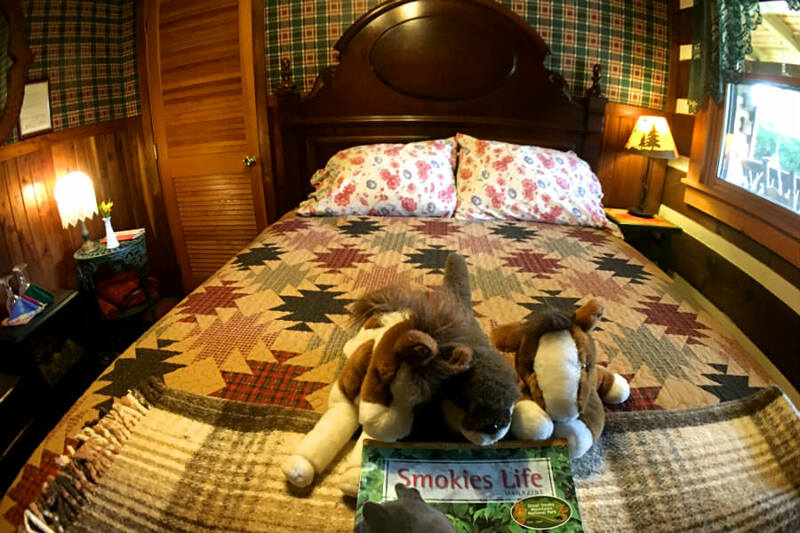 Fireplace, table for two, mahogany dresser and large closet for your belongings make this ideal for a whole week of playing in the Smoky Mountain area. 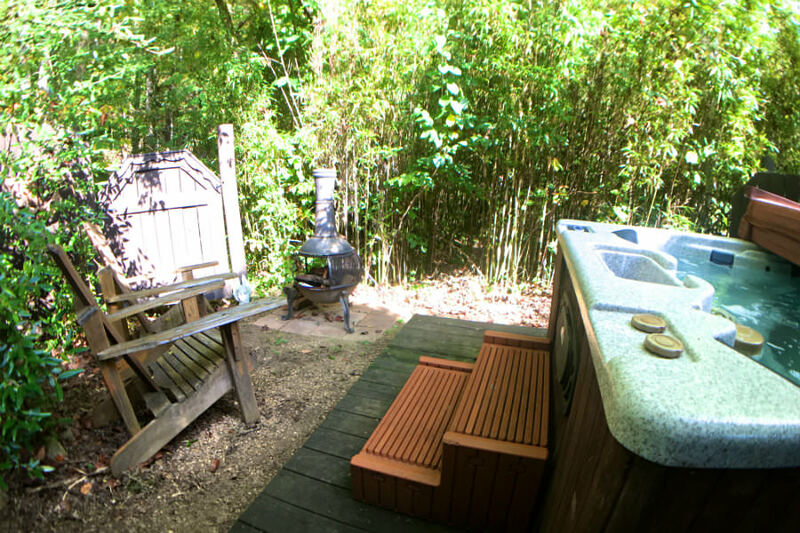 The bath is a spacious shower of blue tile, room for two, and the outdoor path through wildflowers to the hot tub thicket of river cane (a cousin of bamboo) makes the adventure a bit oriental with fireside chairs and fire ring on the river bank. 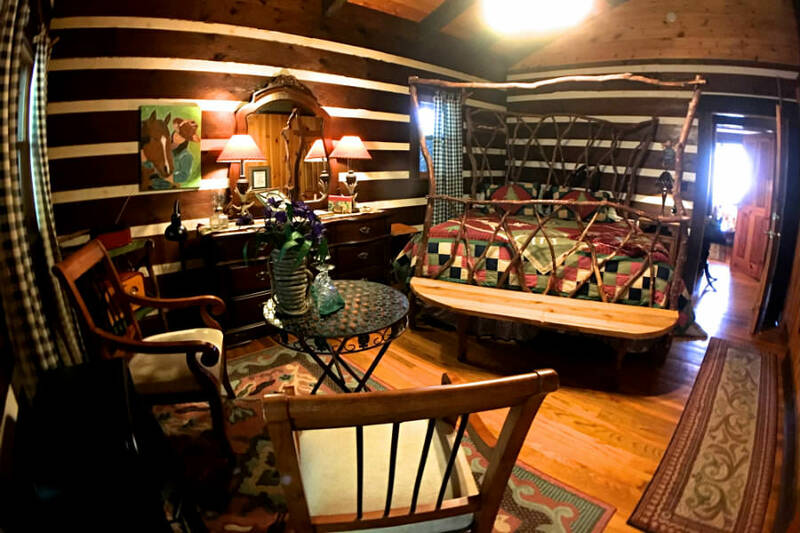 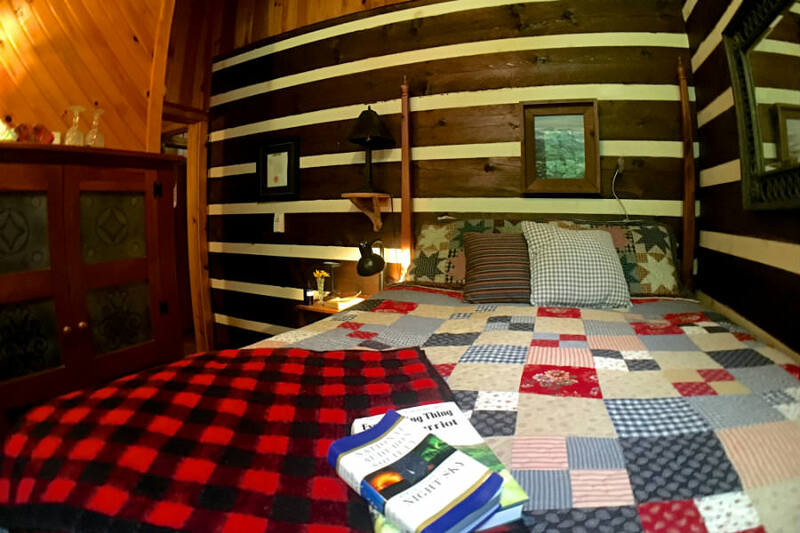 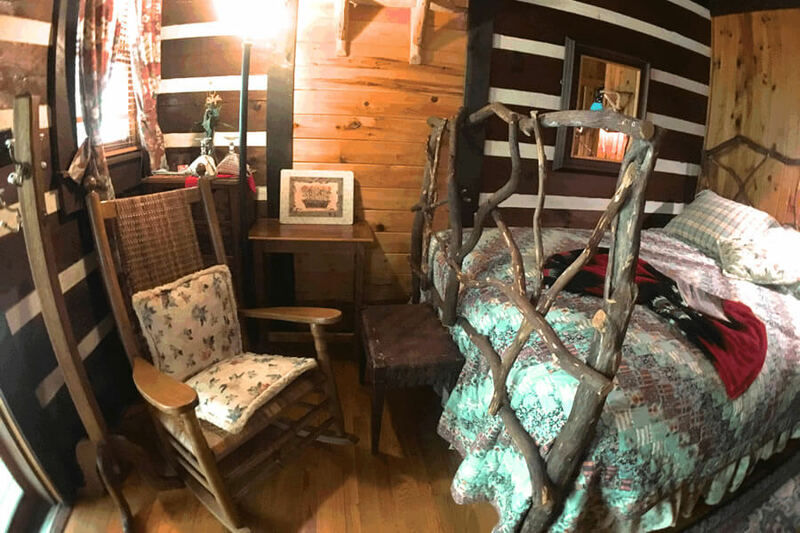 The huge trees of virgin timber on the Albright Trail are a must see in the Smokies, and this room is a must have as well! 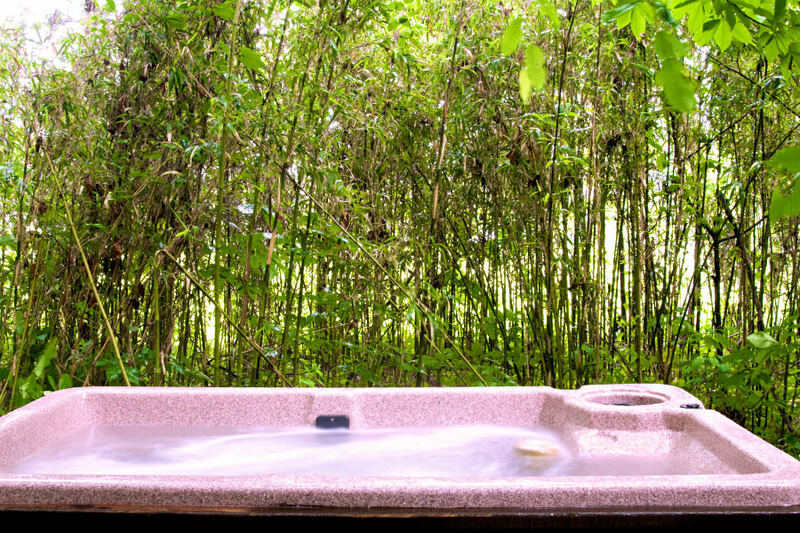 The large Jacuzzi is surrounded by windows and a hoop shower and a tree branch spigot drops showering cascades to refresh you after your in-room tub massage. 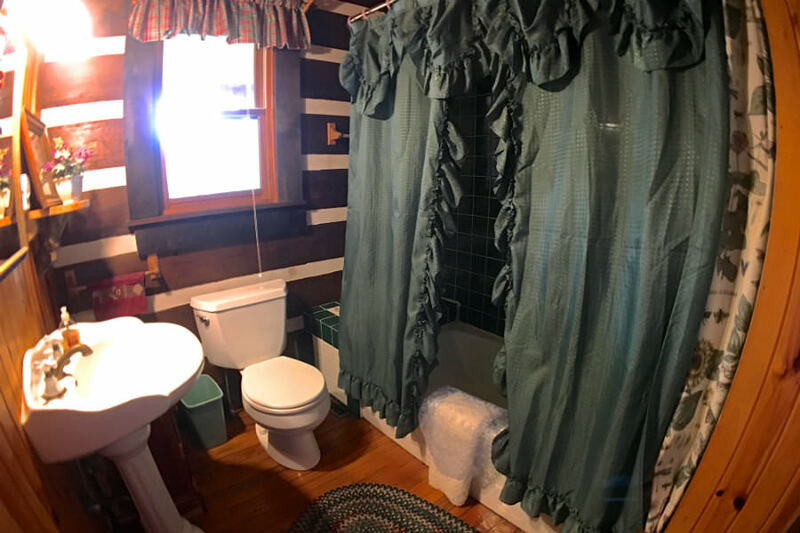 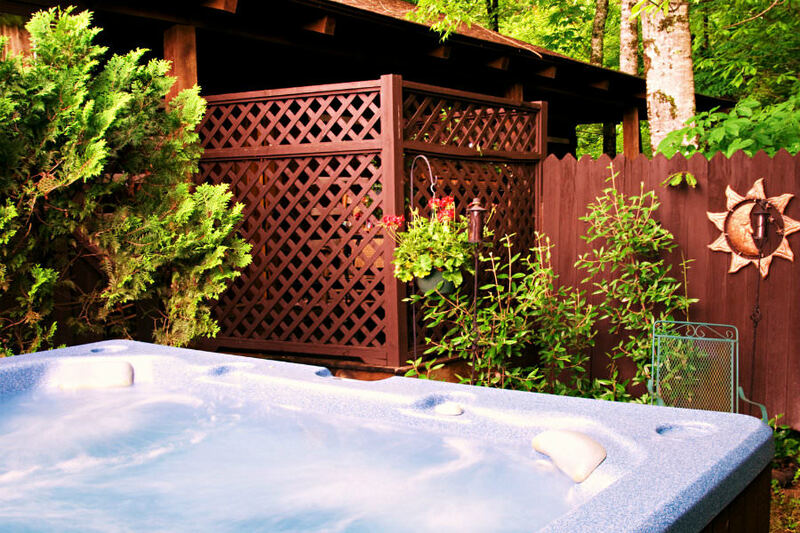 Just outside your door is a private porch with table for two, and a few steps away a hot tub and sitting chairs by your campfire area within privacy fence. 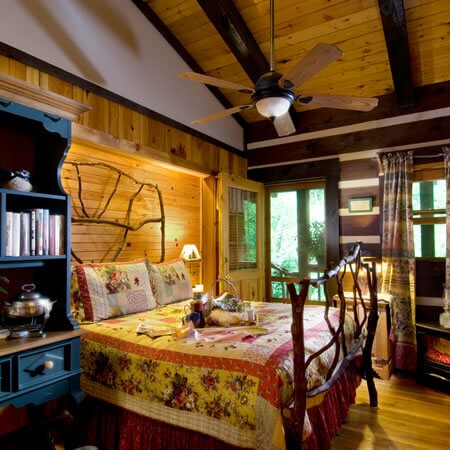 The king headboard is walnut burl purchased from the Biltmore Inn in Asheville, NC. 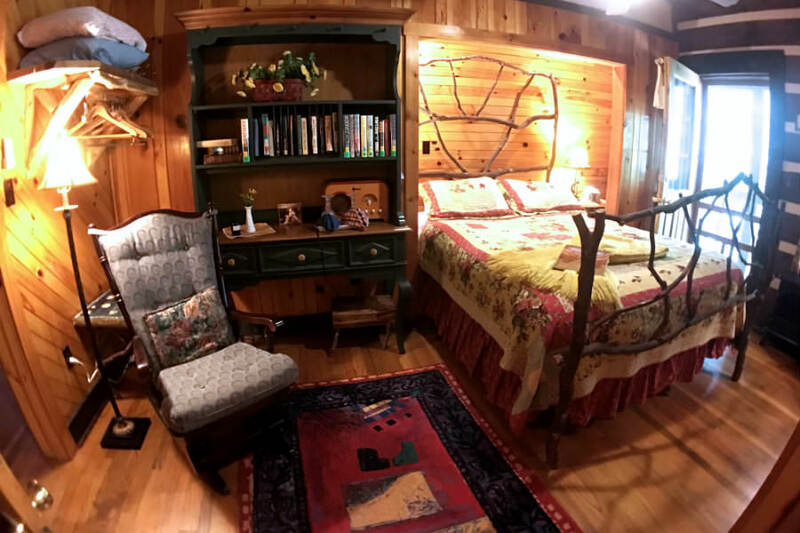 Two upholstered chairs tableside, stereo and Adirondack paddle fan by the armoire with oval mirror and the rich colors of the room-size oriental rug seem to enhance the spaciousness of this pleasant room. 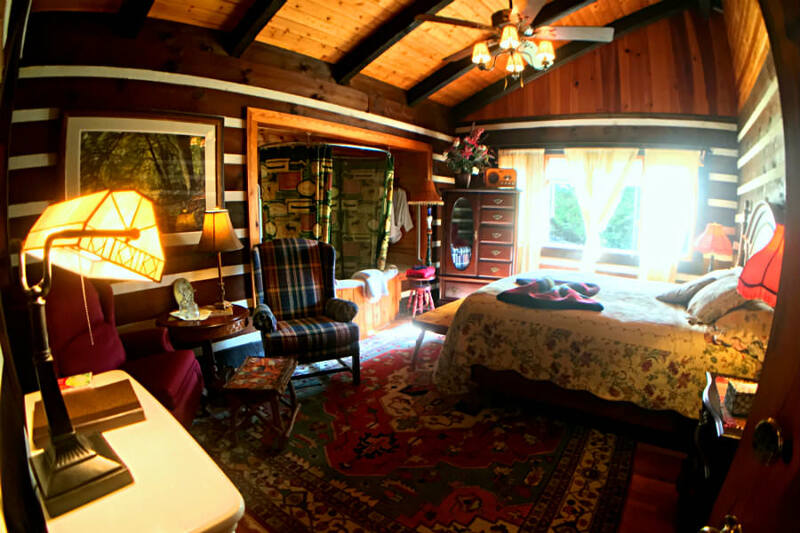 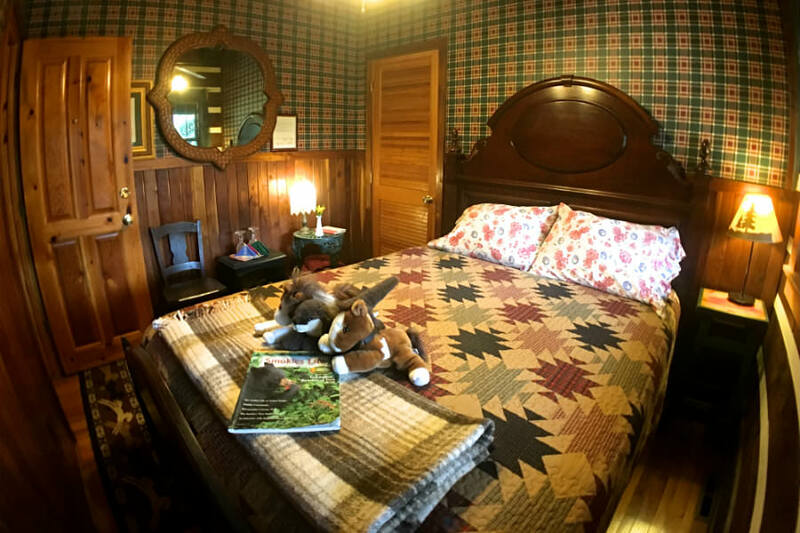 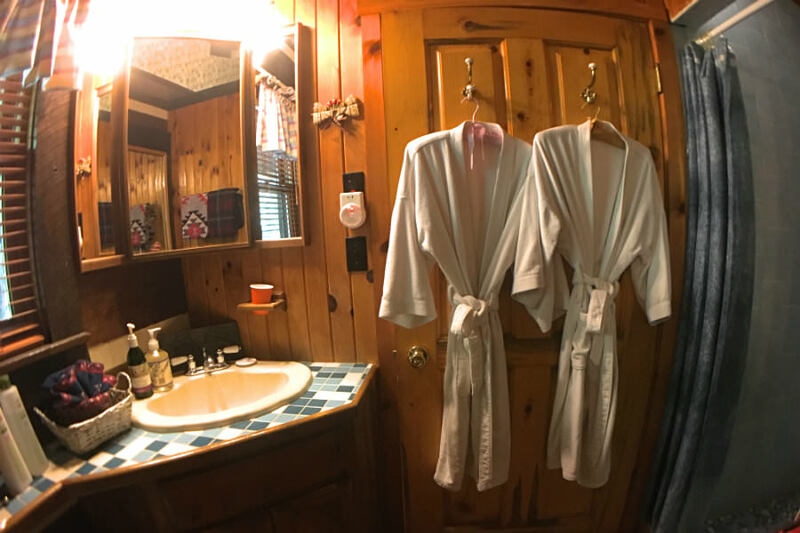 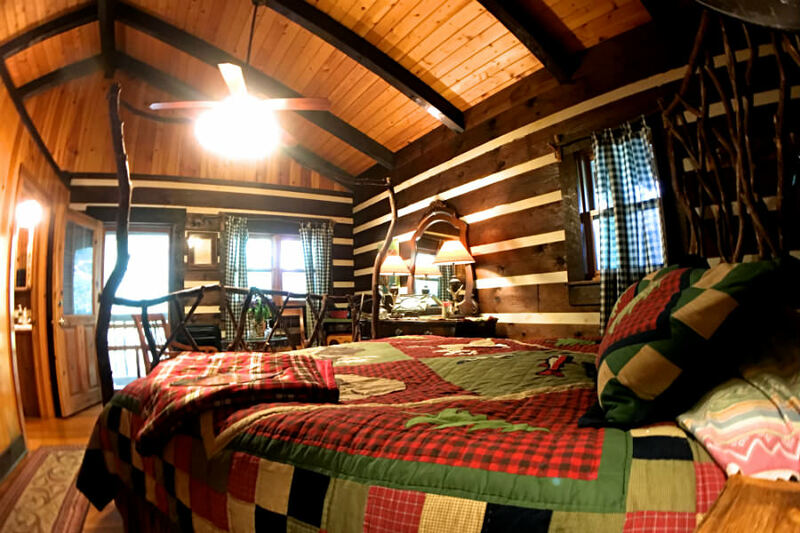 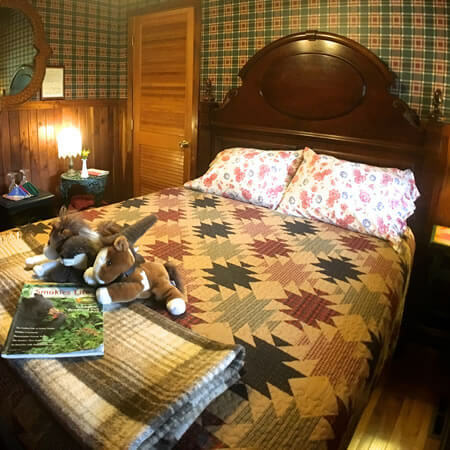 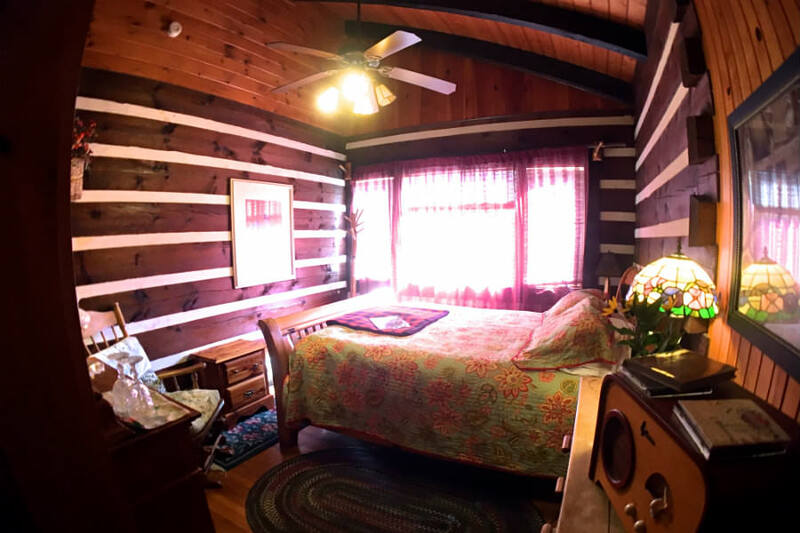 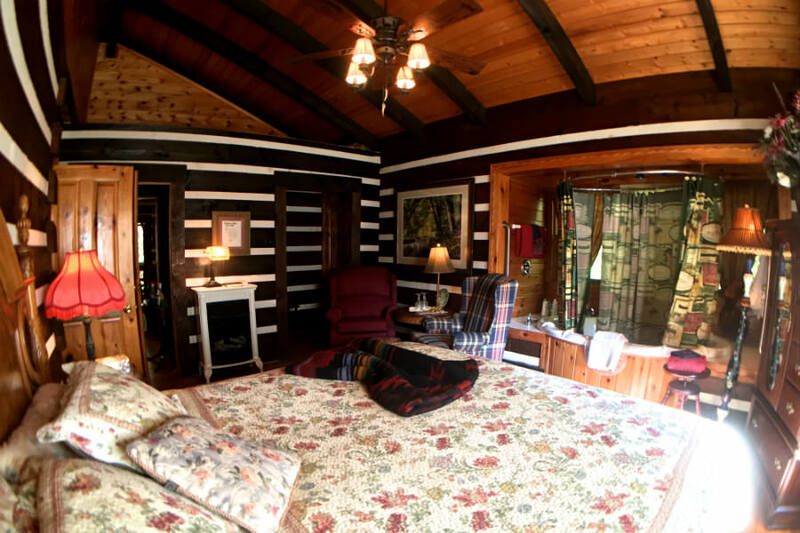 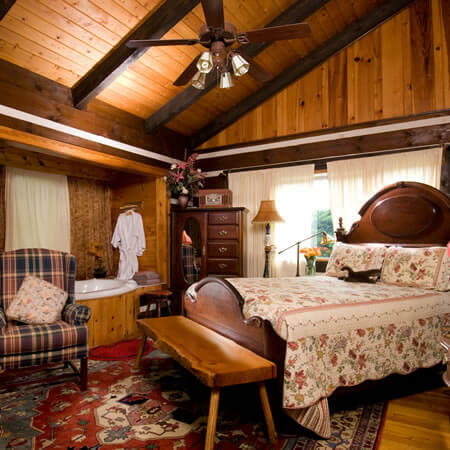 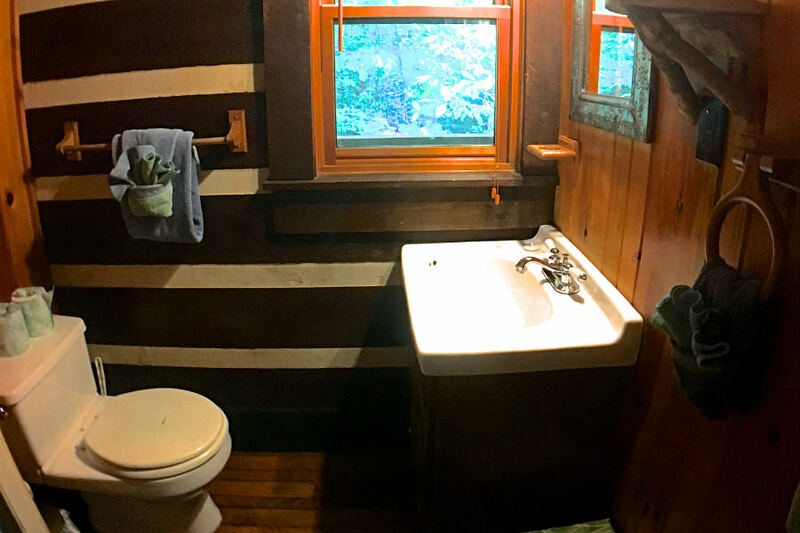 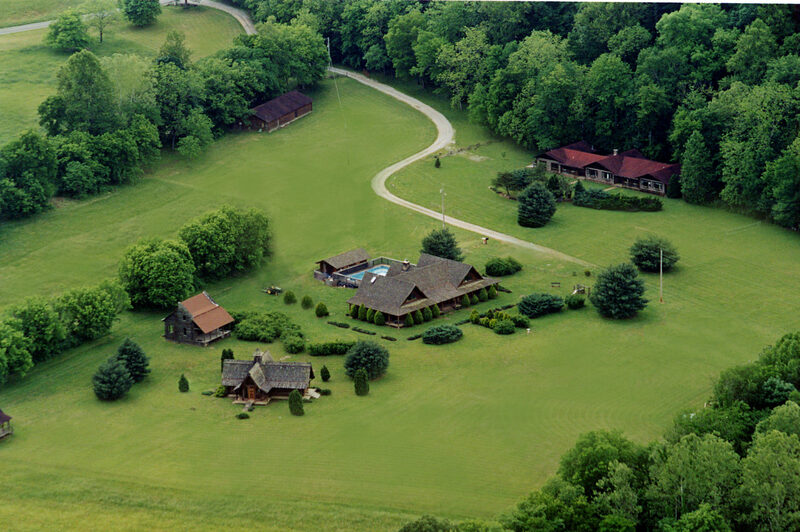 Balsam Mountain features a queen-sized bed, meadow view and a private bath. 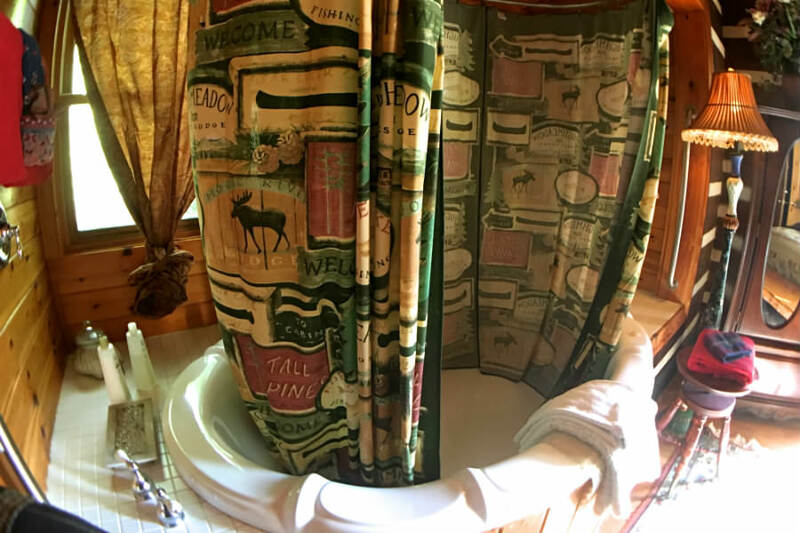 Grotto falls features a queen sized bed, and a private bath (located across the hall). 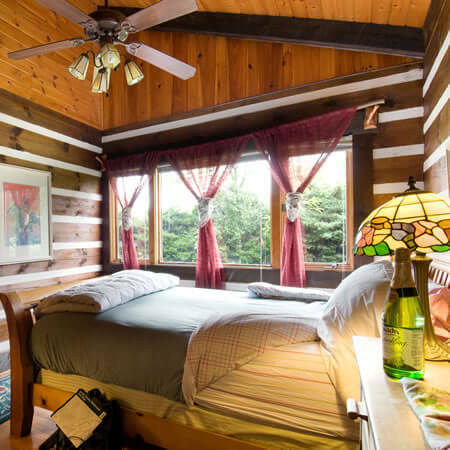 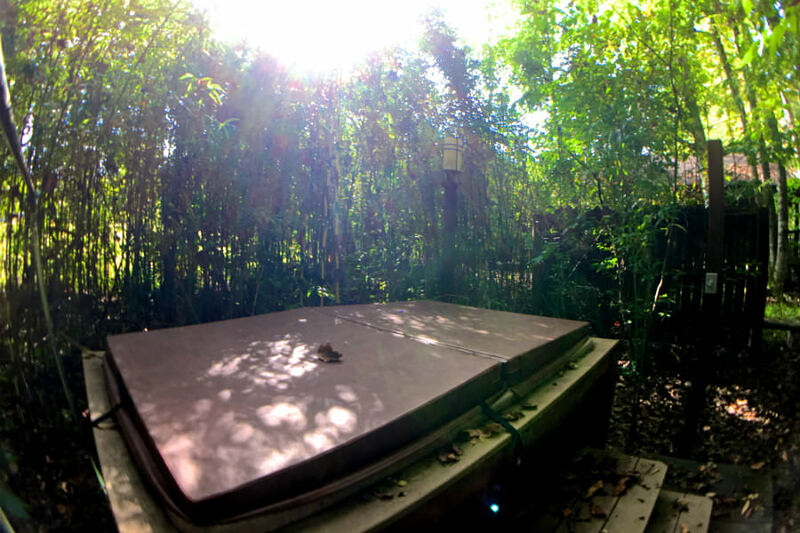 Jump Room opens onto the creek and features a queen size bed and private bath. 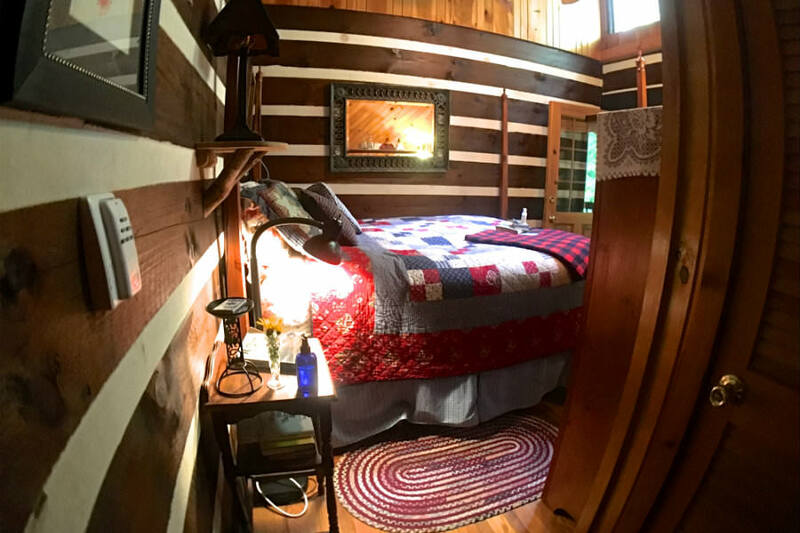 Welcome to our new site! 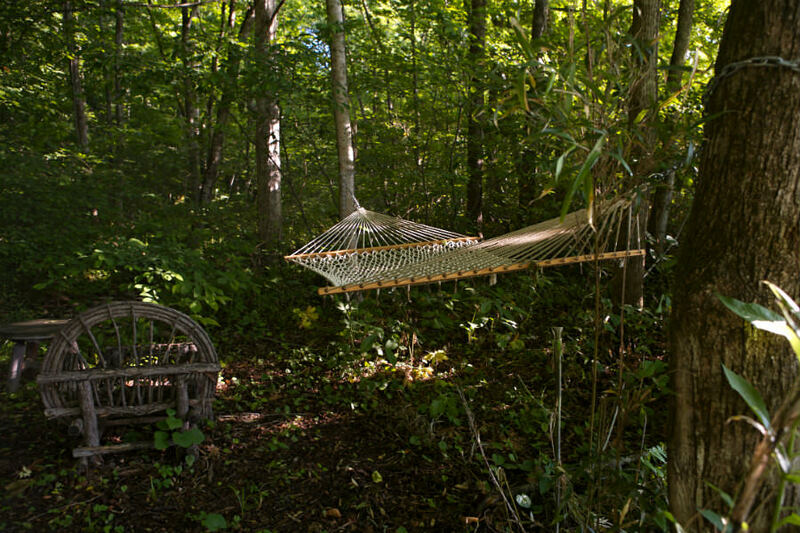 : Welcome to our new site! 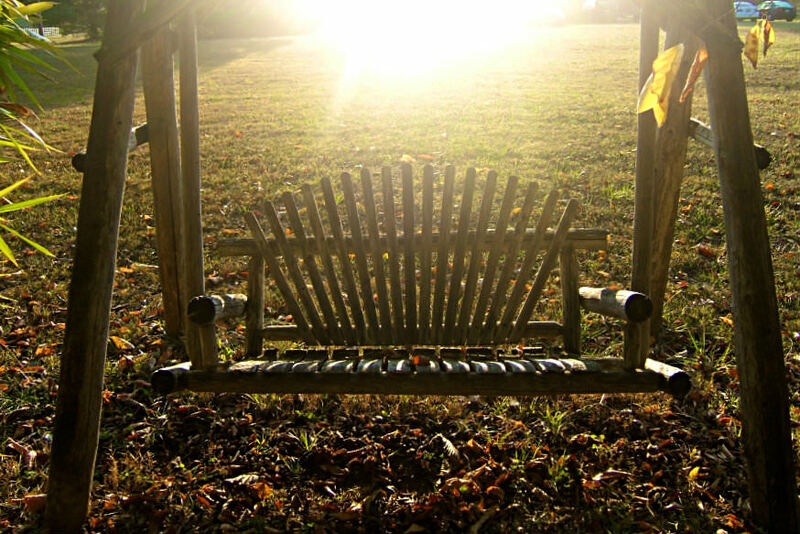 Check back often for updates!